Can the Allies Trust Afghan Soldiers to Watch Their Backs? The good news is that the U.S. government is on the verge of creating thousands of jobs. The bad news is that they're in Afghanistan. But General David Petraeus is hoping that hiring up to 10,000 Afghans and arming them to keep the Taliban out of their villages will help turn things around in the nine-year-old war. Petraeus won the tepid backing of Afghan President Hamid Karzai for the plan, nurtured by his predecessor General Stanley McChrystal, after just two weeks in command of allied forces in Afghanistan. It requires a delicate balancing act  the creation of local forces strong enough to shut the Taliban out of areas where neither Afghan nor NATO troops operate, but not so strong as to undermine the authority of Karzai's central government. While progress is slow in fielding Afghan national security forces to fight the Taliban, U.S. officials believe that a growing number of Afghans are receptive to this more localized initiative. Marine Major General Richard Mills, running operations in the Taliban stronghold of Helmand province, said Thursday he is seeing locals growing increasingly anti-Taliban. "We have strong anecdotal evidence that as Taliban tax collectors enter Marjah at night and enter other parts of this province, that they are repulsed and sent away by the people," he told reporters at the Pentagon in a teleconference. Taliban recruiters also are "being rejected and told to disappear," Mills added. "We're beginning to see the emergence of the people wanting to defend themselves." Petraeus won Karzai's backing for the plan by giving the Afghan Interior Ministry control of the new localized police forces, which will supplement the 130,000-strong Afghan army and the 100,000 members of the Afghan national police. While their role is supposed to be defensive, that may be easier to promise than deliver in a country run by warlords and their local militias for the past 30 years. Some fear that the new rental cops could be easily turned into militias. "These would be local community policing units," Pentagon spokesman Geoff Morrell insisted Wednesday. "They would not be militias." Petraeus' calendar for showing progress is another challenge. A major review of the U.S. war strategy for Afghanistan is less than six months away, and President Obama wants to begin reducing U.S. troops there a year from now. Building even rudimentary security forces takes time, giving this latest initiative just a whiff of desperation as the clock ticks down. It's "a temporary solution to a very real, near-term problem," Morrell said, adding that the force shouldn't take long to train. "This is about putting locals to work so that they can be on watch in their communities for people who shouldn't be there," he said. "And then work with the established security organizations  the army, the police, the coalition  to make sure they don't menace their communities." But the local police forces won't always be operating solo, Petraeus explained at his Senate confirmation hearing last month. Some of them will be "working around our great special-forces A teams who are out there very courageously in villages, and helping to empower and to support local elements that want to resist the Taliban." Petraeus performed a similar, if not identical, magic trick when he and 30,000 additional U.S. troops surged into Iraq in 2007. Many credited that surge with turning Iraq around. But many U.S. military officers say a more important factor was the willingness of the so-called Awakening movement  Sunnis in western Iraq, many of them former insurgents  to fight al-Qaeda. Ultimately, about 100,000 Iraqis ended up on the U.S. payroll through the Awakening movement. But in Afghanistan, any "awakening" is to begin  and remain  under the control of the government. 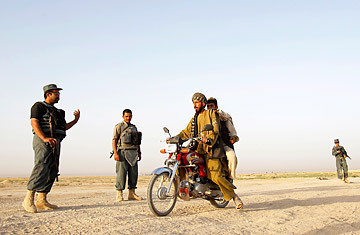 Similar units have recently been created in different regions of Afghanistan, largely in the east and south, with mixed results. Such homegrown security forces tend to work better than those imported as part of a central army. "It encourages neighborhood responsibility for their own security," Mills said. It gives locals "an opportunity for them to defend their own territory, in which they have, of course, a very, very vested interest." Not only are locals intimately familiar with the topography, they also know the local bad guys better than any outsider does. But the challenge for Petraeus and Karzai will be to keep local bad guys off the police payroll. See TIME's covers about armed forces.